There are uncountable numbers of electrotherapy machines in various brands. Definitely, they claim that their products can treat or cure and are effective for almost all kinds of diseases. You might be confused to find what is suitable for you and effective for your suffering. Here is a guide for you to understand how good these machines are in eradicating viruses and bacteria that created your sicknesses. e.g. zapper, magnetizer, multiwave oscillator, scanner, multiwave generator, pulsar, magnetic rejuvenator, body balancer, body ionizer. Yes, what they claim in their pamphlets, manuals and descriptions may be acceptable, and we believe that there were thousands of patients who were satisfied with these machines. However, we also know that there were patients who were not satisfied with these machines and still suffering from same diseases, and with side effects of these machines. What was right and wrong with them? What did they conclude? And this is to answer the questions above to clear the matter that was unknown to some manufacturers and users. There are diseases caused by viruses, bacteria, fungi, toxins, environmental pollutions, radioactive properties, rays, parasites, mental fatigues, and stress. First, you should know the cause of your disease, but it may be difficult to answer, because even the professionals have hard time to find the causes of them all. Most electrotherapy machines kill or eradicate viruses and bacteria (some machines even work for fungi and some cases of parasites). It works by using "frequency" or emitting "electric current" that is induced to the body to strike the viruses, bacteria or fungi. But if the electric current does not strike directly where the viruses and bacteria are present, then, you get only side effects of joule heat burning and destroying good cells. Although, there were thousands of lucky patients who were able to combat and eradicate diseases, there were also thousands of unlucky patients who were not cured but got a "new strain of disease" called sickness of modern age or side effect. Let's take the case of cancer patients who had been affected by nuclear test in Marshall Islands, nuclear bomb and accident in Russia and in Hiroshima and Nagasaki. How about cancers caused by asbestos effects and other pollutions? There seem to be no technical treatment by modern medical profession. Then, electrotherapy machines become useless, too. Herpes — according to today's medical science, it is caused by virus and many believe that there is no remarkable cure or remedy at all. Even electrotherapy machines invented by various popular scientists seem to fail in combating these diseases. According to our latest research report, herpes is not caused by virus alone. Herpes is caused by viruses, bacteria, fungi and other complicated toxins that are produced by negative energy that exists in fifth dimension (see information about Fifth Dimension). The above-mentioned electrotherapy machines also failed to cure the disease. I hope that you understand that forms of herpes are tangled with various causes such as viruses, fungi, and bacteria, thus you have to treat it with various methods at the same time. Herpes can be cured nearly 100% with a simple method in just a week or two. It's a matter of how you use these machines and other available electrical tools and traditional herbs properly. We will explain it later here. Hepatitis and kidney diseases — if it is caused by blood transfusions, alcohols, toxins, and environmental pollutions, then, there is no way to eradicate them by electrotherapy machines alone. In these cases, only traditional herb medications can help in prolonging the life of patients. How about recurrence of the diseases? Even though you gained your former health by the help of electrotherapy machines, there is a possibility of recurrence for most diseases, unless otherwise the immune system of the body is working for the same disease. There are diseases such as mumps, smallpox, and German measles that usually confer immunity after one attack. If a person immunized against a particular disease later comes into contact with the disease-causing agent, the immune system is immediately able to respond defensively. How about to avoid recurrence of the diseases or to prevent such diseases by using electrotherapy machines mentioned above every now and then? No. It is not recommended to use most of these machines for prevention purposes. It is because all these machines burn and destroy good cells and produces side effects. Now, you understand that most of these machines are good and will work fine if the application of them is right. How and where to apply or induce electric current? You must know first the voltage, current amount, frequency, waveform, and time duration. How about side effects (damages of good cells) caused by joule heat? You should understand it. When you know those things, then, you can find the right brand of electrotherapy machine that fit to your sickness. The PYRO-ENERGEN does not induce any current into the body, thus, this is the safest of any existing electrotherapy machines in the world today. Since there are no side effects at all, anyone from babies to adults can use the machine for treating any diseases. If your sickness is caused by virus or unknown cause, then, you may be the lucky one to be treated by the PYRO-ENERGEN. Just bear in mind that PYRO-ENERGEN does not cure diseases caused by bacteria, toxic matters, radioactive properties, parasites, alcohols, environmental pollutions, food poisonings, and blood transfusions. If you know or understand that your sickness is caused by bacteria, we do not recommend using electrotherapy machines. Today's medical technology can combat them with antibacterial medicines. Even traditional medicines work remarkably. If your sickness is caused by virus or unknown cause, then the PYRO-ENERGEN treatment is very much recommended. Even patients who have some metallic items implanted in their body can be treated by the PYRO-ENERGEN unlike any other electrotherapy machines. Let's go back to herpes. It is one of the hardest diseases to be treated. Since it is a disease with various causes, it is necessary to treat it one by one with patience. At first, about 25 minutes of treatment with the PYRO-ENERGEN, then, about 30-60 minutes treatment with an "incandescent lamp". This kind of treatment is effective for diseases tangled with fungus and bacteria-like poison-producing substances. Do not apply any ointments or other methods of ultraviolet and infrared rays. They will just make it worse. If you have such experiences, then you knew it. 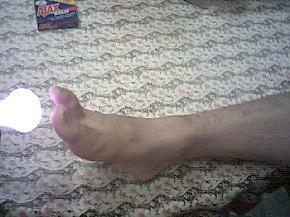 Prepare an incandescent lightbulb 40–60 watts (also see article "Fungus – Simplest Way of Treatment"). 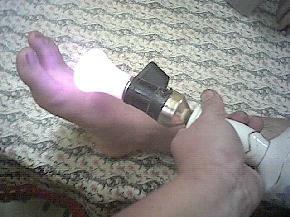 Place the bulb as close as possible to the affected area of your skin. Keep the light there until you cannot endure the heat, and then move it away. Again, apply it the same way until you cannot endure the heat, and then move it away. Repeat this procedure for about 25–30 minutes. Do this 3–4 times a day. Finally, you can take traditional herbs for supplement. By doing this simple method, almost all kinds of herpes problems will disappear in a month. Did you know that this is the cheapest and most effective way? While it is true that ultraviolet and infrared rays work in eradicating fungi and bacteria in a laboratory, they do not work for your body. How about hepatitis? According to our research and records, there are various kinds of hepatitis. As you know, there is hepatitis type A, B, C and so on. But still, they are all the same kind of hepatitis. There is hepatitis due to mumps, rubella, cytomegalovirus, and Epstein-Barr virus. Aside from these, there is hepatitis caused by drugs induced including alcohols, toxins, and pollutants being inhaled. The PYRO-ENERGEN is good for only viral-caused hepatitis but not including those caused by blood transfusion or those transmitted sexually. We have no definite records for this at moment, so we need to study more. The PYRO-ENERGEN is the only electrotherapy machine that does not require any physical examination before treatment or where (location or part of the body) to apply, unlike any other existing machines. To avoid recurrence and prevention of viral diseases, we recommend using the PYRO-ENERGEN at least once a week. The PYRO-ENERGEN is superior among all electrotherapy machines.